Alyono wrote: Glad you made it out alive! If there were cat 3 winds, why did he say that it was like a jet plane? Winds were too intense for the storm chasers there and almost everything was FLYING! You are thinking of 195 km/h 10-min most likely, which is 260 km/h in 1-min. Why on earth would you say that with a storm of probably 330 km/h winds? This statement is ridiculous. Central Tacloban had winds of probably 245 km/h. You are saying that because YOU PROBABLY FORGOT that Haiyan wasn't a low-end cat 5 storm. IF it were, your statement would be correct but because it was a high-end cat 5 - it had at least super typhoon winds. TOLOSA WAS ONLY 29 km away - that's where the eye passed - and that is not too far for STY winds. Basey had high-end cat 3 winds. THE PIC ^ showed its strongest winds north of Tanauan - Palo. Tacloban did not have the strongest winds, and still super typhoon (240 kph) winds aren't the strongest and that's what they had. Don't tell me Haiyan was not a HIGH END cat 5. Cat 3 [you said] and cat 5 are a big difference. I NEVER SAID TACLOBAN HAD THE STRONGEST WINDS, GUSTS IN TOLOSA WERE ABOUT 380 KPH! stormstrike wrote: First of all, I'M ALIVE!! Thank God. So happy to see you posting and that no one in your family died!!!!! God is great! it's nice to see you posting again.. Maximum winds must be concentrated in a relatively small area, right? the maximum wind however ... we don't know where that concentrated winds struck. Thanks for sharing your story Stormstrike!. That 30 minutes of shaking was clearly your penetration into the eyewall. Center landfall seemed about 7 :15 am from a storm chasers lowest pressure reported in Taclabon City. That means you probably went about halfway deep into the north eyewall. Glad your OK!!!! Wow what a very scary story Stormstrike! I don't know how I would feel if I was in that...Hope you don't have to go through that again. I came across this video that says it was shot at Abuyog Community College, Philippines, which, on Google Earth, measures 6.6 miles south of where the southern edge of the eye of Haiyan crossed the coast. Because of the low visibility and lack of trees, I can only guestimate the winds are somewhere between 125 and 170 mph. Quite a range, I know. The power looks extreme; but the fact that the one super palm tree does not snap and the buildings are holding up, makes me not be "sure" the winds are in the upper lever noted above. Highest winds I've seen so far of this storm. I am very glad to hear that you are alright! Stormstrike, I'm so glad you're okay! We were all worried. Tacloban probably had at least Cat 4 sustained winds, perhaps Cat 5 in some spots. That is the kind of damage we have not seen in the US in any recent storms, at least not since Andrew (and it was much more widespread than during Andrew). Some islands certainly saw high-end Cat 5 winds (i.e. over 180 mph sustained). Consider the trees. There was widespread debarking even as far inland as Ormoc (and beyond). I don't remember seeing any debarked trees after Katrina in the MS coast from wind, and not even after Charley in Punta Gorda. That is a sign that winds were clearly extreme, beyond anything the US has seen recently. CrazyC83 wrote: Tacloban probably had at least Cat 4 sustained winds, perhaps Cat 5 in some spots. That is the kind of damage we have not seen in the US in any recent storms, at least not since Andrew (and it was much more widespread than during Andrew). Some islands certainly saw high-end Cat 5 winds (i.e. over 180 mph sustained). I think this is my favorite post made this this topic in a month (Stormstrike's story was intense and quite a read I must say too). OT: How did you fare through our ice storm Crazy? Post in the Canadian topic about it! Just using mobile net. Still no electricity and no wifi net. Before everything, Taclobanons would like to thank the foreign aids especially to the Americans, Canadians, Koreans, Chinese, Taiwanese, Japanese, Singaporeans, Israelis, and other foreigners that I did not see yet helped us greatly. Hehe No thanks to the PH Gov't for their very slow response especially to M** R****. As for my location, it's just roughly 500 m from the border of Tacloban-Palo. So I assume I'm at the southernmost part of Tacloban City. As for the debarking of trees, I remember clearly that ALL trees that I saw, except for some coconuts and bamboos, had no leaves left, some even had no branches. Trees were only like matchsticks at the mountains from afar. As for the max winds, I don't know about that. I got scared. I tried observing from our balcony. The rains together with the howling wind was very painful. It was like piercing me. I immediately went inside our house. It stayed south of me! "Guiuan beachfront today on the Pacific side. 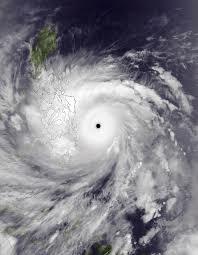 It took the full force of super typhoon Haiyan near peak intensity. Looked like a nuke had gone off." Officials say count is lower than expected. They expected zero before Haiyan came. One thing that surprises me is that Haiyan trails Bopha as the costliest typhoon to strike the Philippines. HurricaneBill wrote: One thing that surprises me is that Haiyan trails Bopha as the costliest typhoon to strike the Philippines. Don't believe the report of NDRRMC, I bet it's not reflective of the real number... plain common sense is enough to guage the impact of Haiyan vs Bopha. NDRRMC always preach the "zero casualty campaign" since 2010, but look what happened in washi(2011), bopha(2012), haiyan(2013), it keeps getting worse.